When The Body Politic newspaper was founded in Toronto, inspired by the success of the very first gay march on Parliament Hill some months earlier, the paper called for gay liberation. It had close ties to the Glad Day Bookshop—the only bookshop in Toronto for many years that specialized in LGBT literature (Warner 116). It was quickly noticed outside the LBGT community, and Barbara Frum of CBC talkshow As It Happens inquired about it in a CBC interview—proof of its growing clout (CBC Archives). 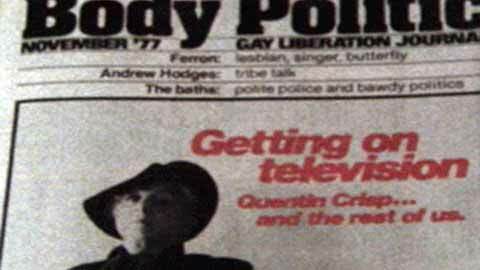 Contributors to The Body Politic tried as best they could to avoid the scandalous image that gay and lesbian magazines often incurred, attempting to fund their enterprise without having to turn to advertising (CBC Archives). The Body Politic was charged with publishing obscene material twice, and was raided once in 1977 after its publication of an article entitled “Men Loving Boys Loving Men” (Nardi and Schneider 331). Members involved in The Body Politic eventually created the Gay and Lesbian Archives in 1973, which remains one of the hubs of LGBT history in Canada. Members like Ron Dayman set out historical material from TBP’s business papers, removing it to his house and working in his basement on the collection; TBP‘s records, along with material it saves from gay groups elsewhere, later formed the core of the Archives (LBGT Archives). As such, no one can doubt the importance of The Body Politic as amagazine of immense cultural influence and importance to the LGBT movement. A clip about Body Politic from February 11, 1972. Barbara Frum’s As It Happens features an interview with one of Body Politic’s founding members in order to inform Canadians about the group. She inquires about topics such as 1) whether a person must be homosexual to contribute to the newspaper and 2) what the goals of the Body Politic are. She is also reprimanded by her interviewee Hugh Brewster for her program “Nothing to Hide,” which Brewster contends portrayed homosexuals in a bad light. Brewster also speaks to the fact that The Body Politic is trying, as best it can, to avoid including personals in its publications—the newspaper is attempting to rally against the hyper-sexualized portrayal of the homosexual lifestyle.